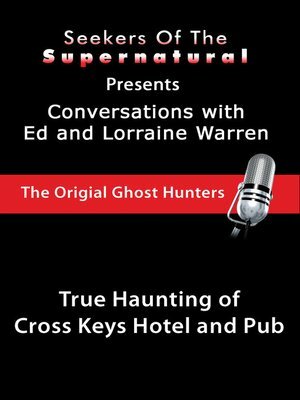 In this interview with Ed and Lorraine Warren we travel to the ancient land of Scotland and the small town of Peebles where a haunted pub has tormented owners for decades. Our moderator, Tony Spera, interviews hosts, Ed and Lorraine Warren, about their many trips to Cross Keys Pub and the long line of people they have interviewed there. The Warrens have no doubt that this pub is haunted, as Scotland is known to be a very supernatural place, from the Loch Ness Monster to the quicksand bogs of the Highlands. Most pubs are centuries old and have many stories to tell, some more mysterious than others. The spirit haunting this particular pub has a name: Marion Richie. She is a very robust and capable Scottish woman that is not happy with the fact that her pub now has English owners. The prejudice runs deep with her and she was even the cause of an English cook breaking his leg after falling down a flight of stairs. They hang an old painting of her on the wall in attempts to appease her surly demeanor but it seems to have little effect as she still throws anything from beer bottles to vacuums across the room with terrifying force. The owners, at their wits-end, called a priest to have the bar exorcised. During the ritual, Marion showed herself to the priest and frightened him so completely he left the bar and refused to return to finish the job. Marion now has free reign over the bar and, though Ed and Lorraine have visited many times, there seems to be no end to her tirade. Ed admits that many people are skeptical of stories such as these. They get most of their disbelieving and outspoken feedback from Atheists who not only doubt the existence of the supernatural but the existence of a God, something the Warrens have very firm beliefs in, being devout Catholics.